More commonly seen on-the-bone, the leg of pork is a delicious rolled roasting joint that produces a fantastic crackling, too. 500g cranberries, 150g caster sugar, 150g cider vinegar, 50ml orange juice, spice bag (ginger, nutmeg, black peppercorns, allspice), pinch of salt. Bring all the ingredients together in a small pan and boil until very soft, roughly 10 minutes. Drain and blitz to a thick puree, add the lemon juice and then add enough of the liquid to get the correct thick ketchup consistency. It should be a smooth puree that holds its shape when on a plate. Pass the sauce through a sieve and refrigerate until needed. 3kg pork leg roast, 10g fennel seeds, 10g black peppercorns, 20g Maldon sea salt, 2 fennel bulbs - trimmed and roughly chopped, 2 medium carrots - peeled and roughly chopped, 2 medium onions - peeled and roughly chopped, 1 head of garlic - split in half, 1 bunch of fresh thyme, pork dripping or lard, 500ml cider, 500ml pork brother, 100g unsalted butter, Cranberry Ketchup..
Preheat your oven to 200°c and place the roughly chopped vegetables, thyme and garlic into a large roasting pan. Crush the black peppercorns and fennel seeds with the Maldon sea salt in a pestle and mortar until fine. Score the pork leg all over at 1 cm intervals with a sharp knife about 2 mm deep and rub the pork first with the pork dripping then the crushed seasoning mix into the skin of the pork. 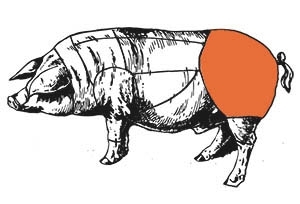 Place the pork in your preheated oven for 20 to 30 minutes or until it's beginning to color, then turn your oven down to 120°C and cook the pork for 9 to 12 hours, until the meat is soft and you can pull it apart easily with a fork. Pour the cider and pork broth into the roasting tray and let it cook for another hour. Remove the pork from the oven and transfer it to a clean dish to rest for thirty minutes. Bring the roasting pan back to a gentle simmer and whisk in the unsalted butter to thicken, pass through a fine sieve and serve with your Cranberry Ketchup.